How many times has someone written to you to tell you that you used their old and busted email address and you should be using their new and shiny email address? It usually happens when someone decides to finally retire their hotbunny73@aol.com address because they realize a grown-up person sounds like an idiot saying that out loud, no matter how fun it sounded in 7th grade. While you’re delighted to have them move on to hotbunny73@gmail.com like an adult, this request from them requires work on your part. If you’re on a Mac, you dutifully open up the Contacts app (or CardHop if you’re one of the cool kids). You search for the person in question, edit their vCard and delete the AOL account and verify that you have their fancy, new Gmail account and hit save. A while later you send an email to them and they write back (with a more stern tone this time) that they told you not to use that AOL address. Confused, you go back into Contacts and their AOL email address simply isn’t there, so how could you have written to it? Turns out Apple Mail has a secret database called “Previous Recipients”. In this database is every single address you’ve ever written to, and it’s associated with the name of the person to whom you wrote the email. If you delete an address or an entire person from Contacts, it is not deleted from this database. As much as I will have enjoyed the email, I might not want to add you to my Contacts. And yet, at some later date, maybe I want to write to you again. I could hunt down the email you sent me since I never throw any away, but with Previous Recipients sitting out there your email address is always available to me. Some hardware and software vendors are worthy of being added to my Contacts, but can you imagine if I had to put all of them in there? Luckily Previous Recipients saves every one for me that I was ever interested in writing to from my Mac. Previous Recipients sync across your Mac and iOS devices so they are available everywhere. This is, as described, a curse and a blessing. It’s easy to start thinking that people are in your Contacts even though they aren’t. 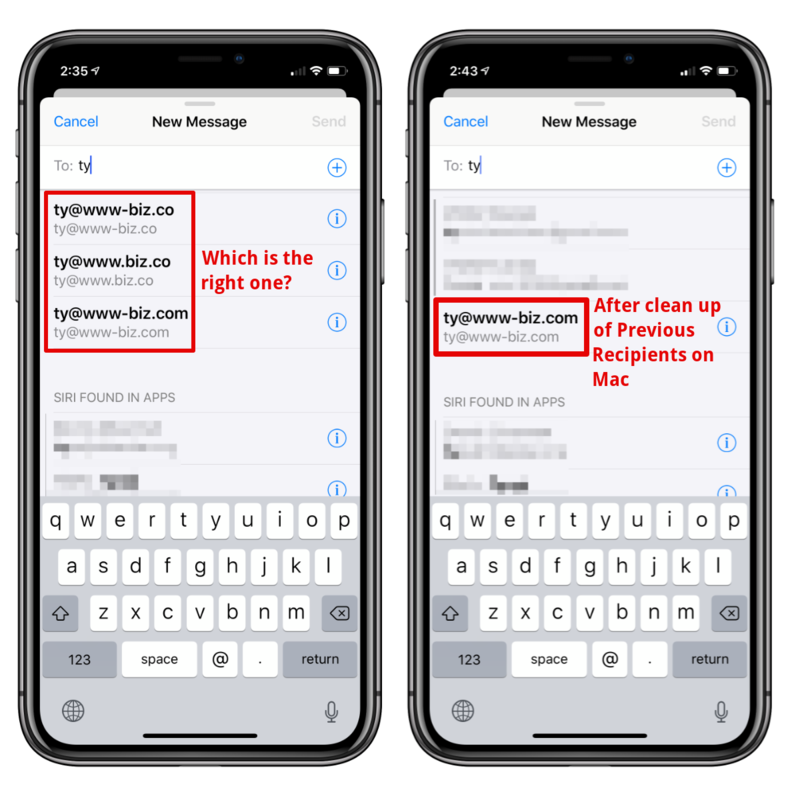 It’s important to know about Previous Recipients and how to work with it because if you switch to Android or Windows you might be confused about why all of your Contacts didn’t port over to the new platform. The good news is that you have easy access to Previous Recipients. Open up Mail, select Window from the menubar, and then choose Previous Recipients. It’s quite likely that you’ll find an enormous list of addresses in this window. The interface is really fantastic and intuitive though so it’s actually kind of fun. You’ll see three sortable columns: Name, Email and Last Used. Next to addresses that are already in your contacts, you’ll see a tiny icon to the left of their name that looks like a contact card. For example, good friend of the show Troy Shimkus is in my Previous Recipients. I can see two entries for Troy. One shows his name and iCloud email address and that entry has the little contact card next to his name. However, right below his iCloud address I also see a Gmail address that I can tell is also Troy, even though it doesn’t say his name and there’s no little contact card. He evidently wrote to me from that account. I would like to have Troy’s Gmail address in my Contacts too, so I can simply click on the Gmail address, and a button in the bottom right will become active that says “Add to Contacts”. Disappointingly, if you add a second address for someone to Contacts, it’s not smart enough to automatically merge the two entries. In the case of Troy’s address, the system hadn’t sleuthed out that it was actually Troy’s address so that failure to merge is understandable. But I found an address for Allister Jenks where it did know it was his and when I added it, I got two entries for Allister over in Contacts. It’s a fairly simple process in Contacts to select the two entries associated with a contact and select Merge Selected Cards from the Cards menu, but it seems like it could be a bit smarter than that. You’ll have to keep Contacts at the ready as you clean up your Previous Recipients. We talked upfront about how your friend wants to you to stop using hotbunny73@aol.com. Using the search in Previous Recipients for “hotbunny73” we can now see both their AOL and Gmail addresses. Select the AOL account and select the button labeled Remove from List. Don’t do this unless you’re 100% sure because there’s no takesies backsies; that contact is instantly removed with no confirmation required and no undo. You can also remove entries instantly with the delete key. Here’s another problem to be solved where Previous Recipients causes a problem but can also solve it. Sometimes we have to enter an email address by hand, and being human, we may type it incorrectly. If you do this and then send email to that incorrect address, it gets stored in Previous Recipients. After you get the bounce-back email, you see your error and type it in correctly this time, but the mistake is still in Previous Recipients ready to be accidentally used again. At CES I met Ty Takayanagi of Dfree. He’s got a very oddly-formatted business address. It’s ty@www-biz.com. I didn’t just type it incorrectly once, I messed it up twice. I typed www-biz.co once and www.biz.com the second time. Finally, I got it right but now if I type “ty” into Mail, I have three choices, only one of which is the secret correct address. A quick trip to Previous Recipients, a search for Ty and I can see the three addresses and delete the two incorrect addresses permanently. As I mentioned earlier, this information syncs across all of your Macs and iPhones. Before I cleaned up my entries for Ty, I checked my iPhone and all three of the entries I had for him showed up when I typed Ty into Mail. A few seconds after I deleted Ty’s two erroneous addresses, I again typed Ty into Mail and I was delighted to see only the correct address for him as an option. There’s not too much more to this tip but I do have one more suggestion. I said there were three sortable columns, but I sort of lied. The column with the little contact card is also sortable. With Previous Recipients sorted by whether they have a Contact card or not, you’ll be able to find people you meant to have in Contacts more easily. I like to check Previous Recipients periodically to clean it up and like I said, it’s actually kind of enjoyable because it’s so easy to work with. Now go get rid of hotbunny73@aol.com already!